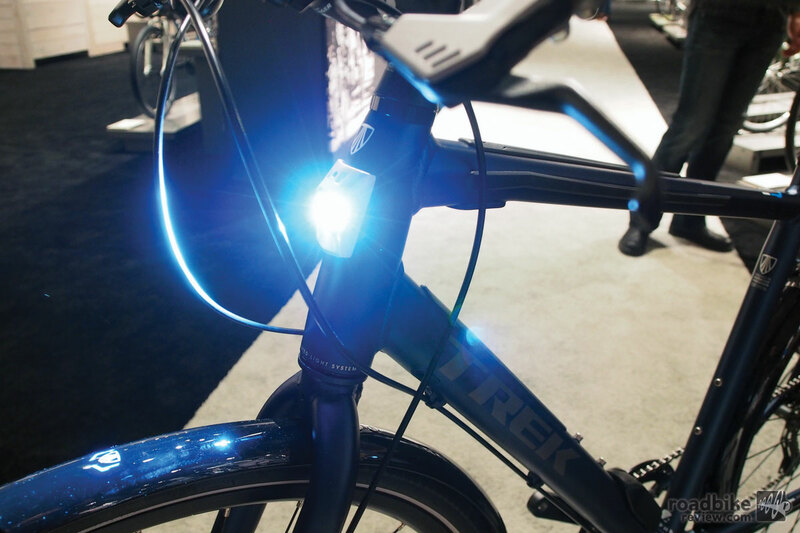 Trek Lync front light beam is enough to see with, even traveling at a fast clip of 15-20mph in complete darkness. 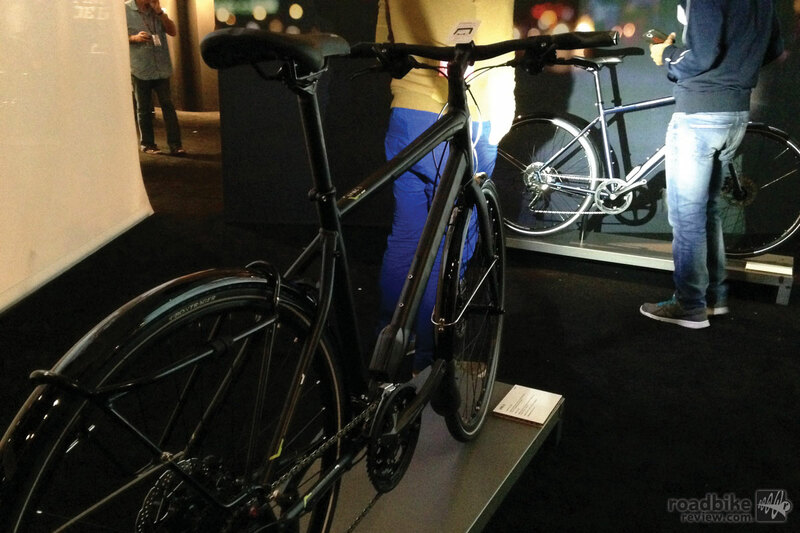 An interesting bike we saw at Trek World was the Trek Lync. 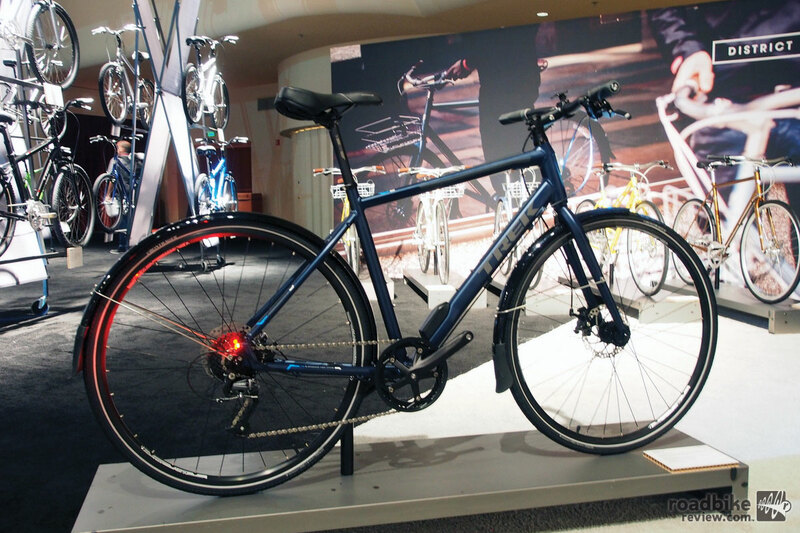 This is a commuter bike with integrated, rechargeable LED lighting. But unlike previous efforts from other companies with tiny ‘to be seen’ lights, the Lync integrates a legitimate head light and tail light into the frame itself. A head light unit, similar to the the one used in the Bontrager Ion 700, is used. It is driven with a little bit of a lower current to lower heat levels and optimize run time. Thus, the light output is approximately 500 Lumens with a run time of 2.5 hours. For reference, typical AA powered commuter lights emit about 30-50 Lumens of light. So this light integrated into the head tube of the frame is enough to see with, even traveling at a fast clip of 15-20mph in complete darkness. Trek Lync light turned on. Tail lights are also integrated into each of the seat stays, so they are visible from either side and won’t be covered by optional pannier bags. The rear lights can be set to flash mode unlike the the headlight, which is not allowed to flash. There are two switches mounted on the bottom of the top tube, near the head tube. Either switch can turn the light on. When on, one button controls the rear light and flash modes and the other button controls the front light, light levels. 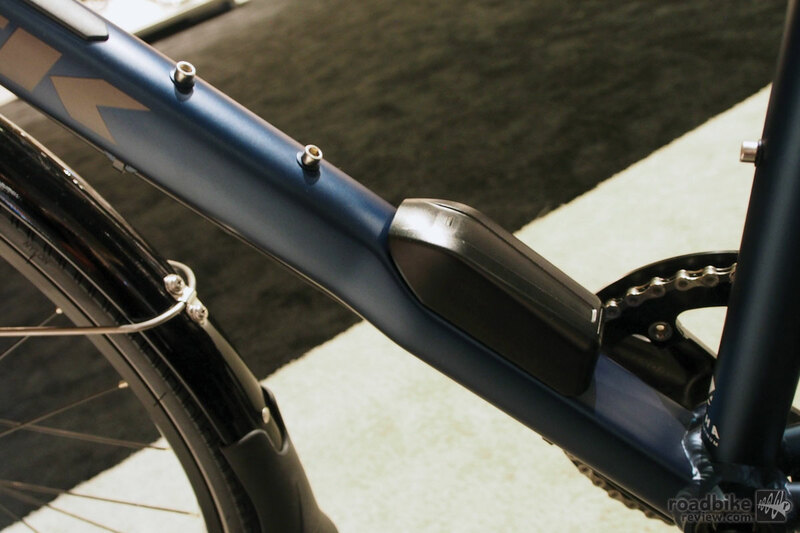 Trek Lync tail lights are integrated into each of the seat stays. The front light can be aimed up and down a few degrees. Aside from integration, the other benefit of the lights is theft prevention. Almost all good lights cost $100 or more and they are perched on the handlebar with either a rubber band or a screw. Thus, they are very easy to steal and the commuter has remove the light every time the bike is parked to prevent theft. 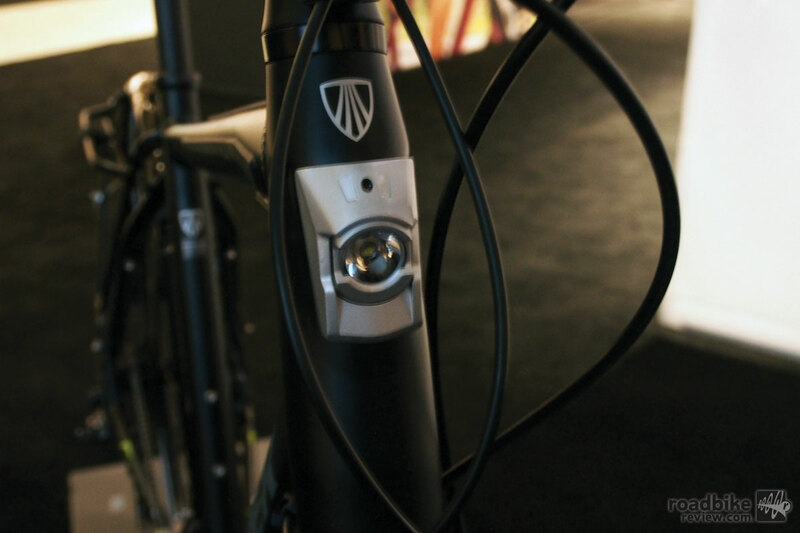 An integrated light solution is part of the bike and is thus theft proof. 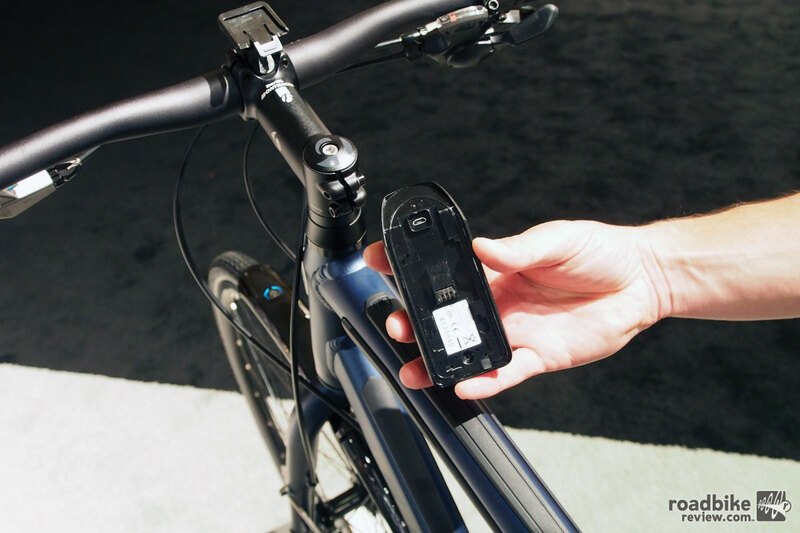 The Trek Lync is available in two configurations, the Lync 3 and Lync 5. The Lync 3 retails for $990. The Lync 5 retails for $1320 and has better components and has an integrated rear rack. 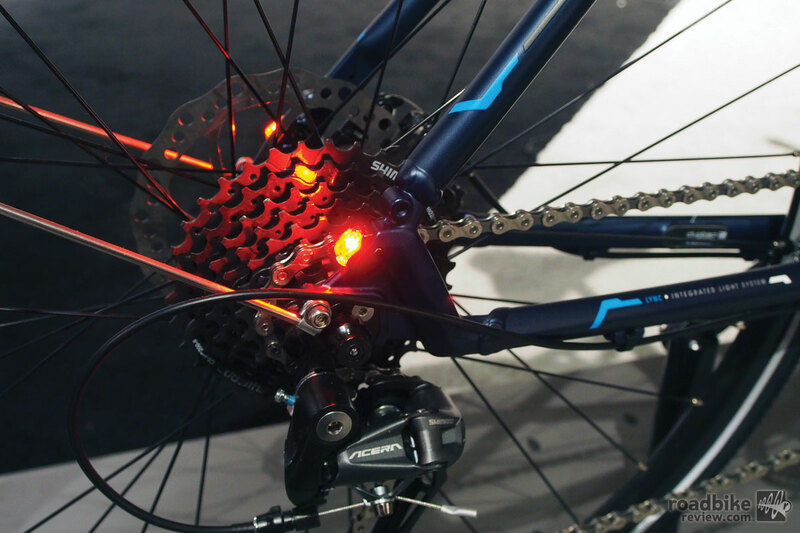 Both bikes come with disc brakes and the integrated lights. 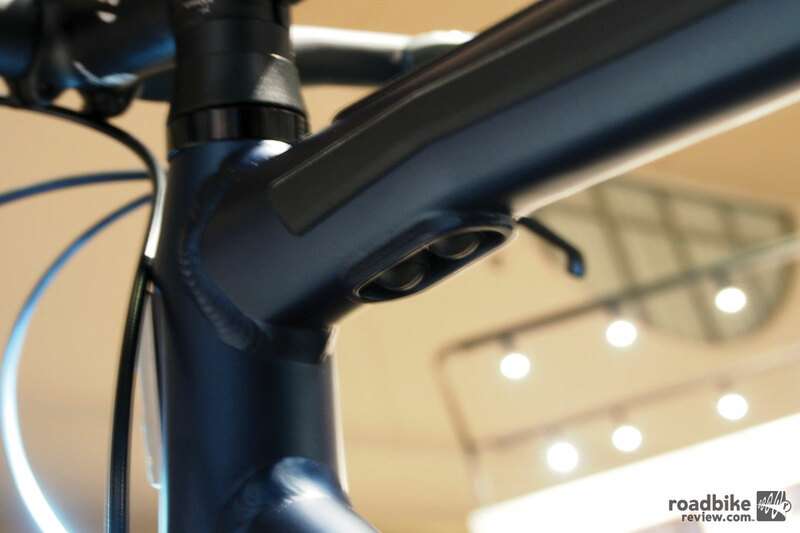 The switch is integrated in to the down tube of the frame. They’re not on the handlebars at the moment to simplify and hide the wiring. Routing it through the steer tube, stem and bars can be troublesome. The battery is perched on an indentation in the frame and it doesn’t get in the way of the water bottle. It is easily removed for charging. When initially connected, the lights flash to verify a good connection. I like it. The only thing missing is making the rear lights function like car lights. Turn on while braking and signaling when turning. I think that’d be useful and would make it the ultimate commuter. That is briliant Keith. That is entirely possible now. Trek has an ‘Integration’ team and they will be working on all these things. Signal lights, motors, chargers, etc. @keith, why do you want to make a bike a car. A bike is not a car, don’t over engineer a bike to be something it’s not. moos, I don’t see why not. If you are sharing the road with cars and motorcycles, be visible like them and act like them with the same technology; running lights to be seen, brake lights and turn indicators. That’s all we ask for.. They should use a dynamo hub. Actually there Devinci Newton and a few others have been doing this either lately or for awhile. Having said that the lights level of brightness Trek or the others have installed are very inferior to stand alone lights. If you want lights that are very bright you’ll still have to add those on your handlebars and rear of the bike, so I don’t see the point in this other than to raise the cost of a bike up to have lights that are nothing more than supplemental. The other question I have about them, how expensive is it to replace a burned out bulb? yes LED’s burn out, I’ve seen newer cars with them burned out; and how expensive is the battery to replace when it no longer holds a charge? I can all but guarantee you that all of that will be expensive because their proprietary, and in that expense a person would be further ahead to buy stand alone lights instead of repairing that which broke. I am contemplating buying a Lynx5. I did see in a review that the built-in rear rack is not acceptable. It is difficult to find panniers to fit the rack and you can’t strap anything down on the rack because of its position. I just purchased the Lync 3 as a second bike for getting around Portland. I purchased it at Bike Gallery in downtown Portland. The bike is perfect for my needs and when we go out for dinner at night know that I can see and be seen. The components are adequate for getting around town and especially like the front and rear disc brakes as they are smooth and dependable even in our inclement weather. The battery back is very easy to remove and charge and the light is clean and bright. So far I don’t have any complaints, however, I am only about 150 miles into it.